New Zealand anaesthetists interested in the investigation of anaesthesia related anaphylaxis first met in Christchurch in February 1991. The New Zealand Anaesthetic Allergy Group included specialist immunologist/allergists and anaesthetists involved in the investigation of perioperative allergic reactions. A comprehensive list of aims and the development of recommendations was agreed upon. Aims of the group included regular meetings to establish a network for those involved in testing, development of guidelines for use by investigators and development of a standardised form for reporting suspected anaphylactic reactions during anaesthesia. Australian anaesthetists became aware of the advantages of such a network. An organisation involving specialists involved in perioperative allergy management throughout Australia and New Zealand was formed - the Australian and New Zealand Anaesthetic Allergy Group (ANZAAG). The first meeting of the Australian and New Zealand Anaesthetic Allergy Group took place in May 2010 at the Christchurch meeting of the Australian and New Zealand College of Anaesthetists (ANZCA). A subsequent meeting was held in September 2010 at the Gold Coast. This meeting followed the annual meeting of the Australian Society of Clinical Immunology and Allergy (ASCIA). Agreement was reached regarding aims and immediate working priorities for the group. ANZAAG is a not-for-profit organisation with a focus on assisting and educating colleagues to deliver quality care for patients. The group members include specialist anaesthetists, specialist immunologist/pathologists, specialist immunologist/allergists as well as technical laboratory specialists. The resultant group allows for development of resources which are extensively reviewed, based on best available scientific evidence and many collective years of clinical practice in the area of perioperative allergy and anaesthesia. All management documents have involved consultation with ANZCA, ASCIA, the Australian Society of Anaesthetists (ASA) and the New Zealand Society of Anaesthetists (NZSA). 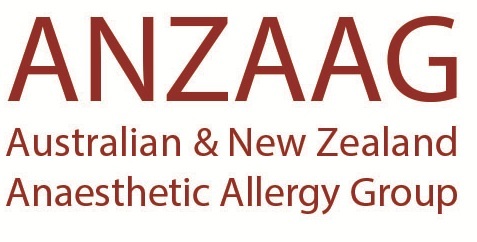 ANZAAG Executive members provide core representation and expert advice to the allergy sub-committee of the ANZCA Quality and Safety Committee. Representations are made to relevant government bodies including the Therapeutic Goods Administration and Health Departments where they are indicated by available research or clinical issues. ANZAAG aim to continue to develop high quality resources to aid with the many issues which arise in relation to perioperative allergy. A long term aim of the group is to work with the Australian and New Zealand tripartite Anaesthetic Data Committee (ANZTADC) to develop a data base to better understand the many issues involved in delivering high quality care to patients who experience perioperative anaphylaxis throughout Australasia. Members are from Australia, New Zealand, Malyasia and Hong Kong.